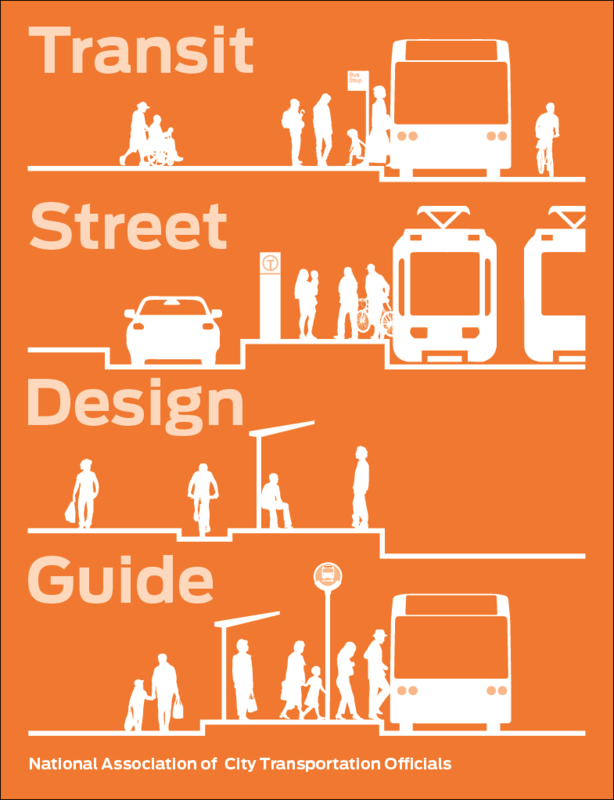 Streetcar and light rail lines can be configured in the right-most travel lane, either curbside or offset by parking. Streetcars and downtown light rail lines in many cities are served by side-running rail. Whether in dedicated or mixed-traffic lanes, rail paths must be kept clear from all but the briefest obstructions. Streetcars and light rail vehicles (LRVs) have their own geometric needs that may differ from buses. 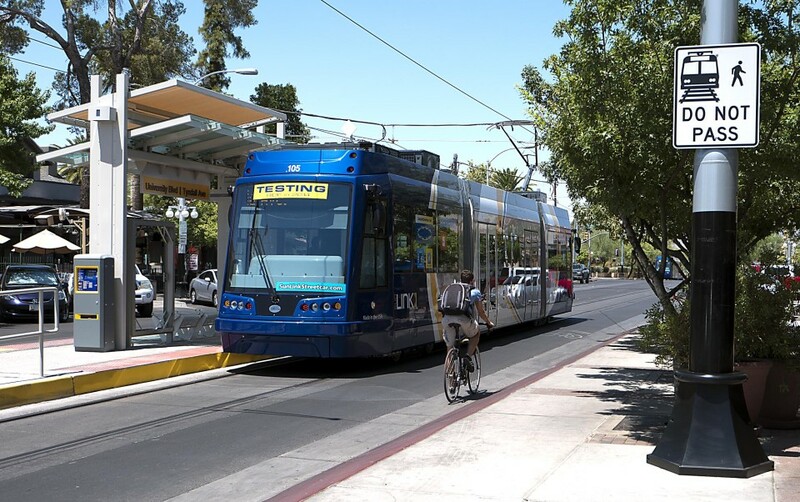 While curbside rail lines are often furnished with a separated guideway, more flexible streetcar lanes may be desired to accommodate turning movements or off-peak traffic flow. On two-way streets, offset streetcar and light rail lines operate in the right-most motorized lane, adjacent to a curbside parking lane. This operation allows boarding bulbs or islands at stations, and can accommodate loading, parking, and right turns to the right of the streetcar. On one-way streets with parking, offset rail lines operate in the left-most or right-most lane. A dedicated lane is preferable to mixed-traffic operation for curbside and offset rail, except in cases where even peak period traffic does not inhibit transit operations. Where streetcars or LRVs operate in a curbside lane, a protected curbside transitway is preferred to physically prevent or discourage incursion by other vehicles. Dedicated streetcar or light rail lanes preserve on-time service, which is particularly important given the inherent inflexibility of streetcar routes. 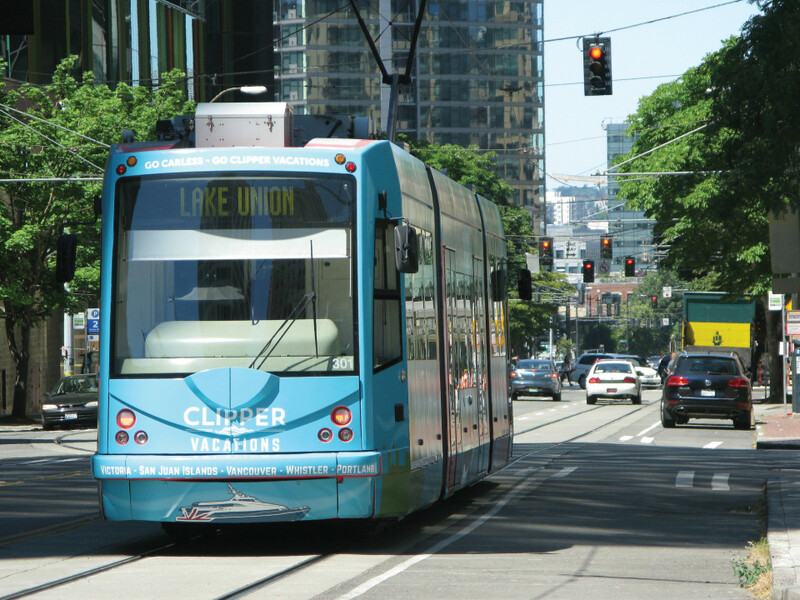 Streetcars can provide a well-branded service with a higher capacity and a smoother ride. Offset streetcar lanes create room for pedestrian realm enhancements such as boarding bulbs and islands, curb extensions, bioswales, planting strips, and parklets, while leaving space for on-street parking that is accessed by crossing the transit lane. Offset streetcar lanes must be clear of overhanging mirrors or other parts of parked cars. Lanes should be assigned the full width needed by the streetcar, with clear demarcation of the edge of the parking lane. Catenary wire typically hangs 17–20 feet above street level; coordinate overhead elements with street trees and traffic signals. Plan streetcar and bicycle routes concurrently so that bicyclists are fully accommodated within the network. Crossing tracks unexpectedly or at smaller angles presents danger for bicyclists. 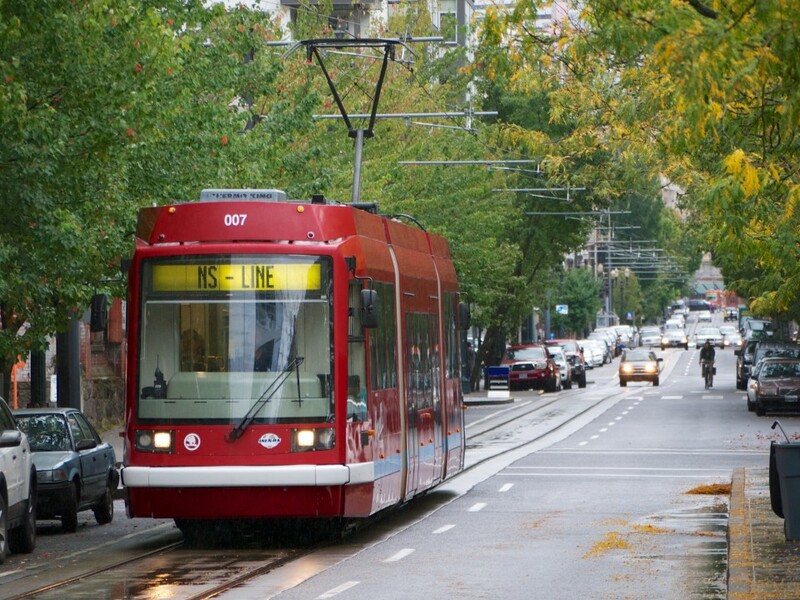 Curbside rail lanes can be designed to be suitable for bicycling but require more width and typically require designs that let bicycles pass to the right of the streetcar at stops. Local access by bicycle is a component of nearly all urban streets; where possible, bicycle traffic should be positioned on a different section of the street. Parallel, high-comfort routes should also be provided. Streetcars typically have larger turning radii than buses. Where a streetcar makes turns, care must be taken to clear the entire swept path (see Intersection Turn Radii and Recessed Stop Bars for complementary treatments). Rail lanes may sometimes need to be shared between streetcars and buses, or lane design may need to be interoperable to accommodate bus replacement of rail service. Rail lanes may be narrowed at platforms. Where dedicated lanes cannot be provided, a combination of signal priority and short dedicated sections can be used to create a virtual transit lane. Bicyclists should be directed to portions of the street that are out of the way of tracks, especially where tracks cross the bicycle’s path of travel at an angle. Embedded rails, switches, and seams are dangerous for cyclists and should cross bike paths at 90 degrees or as near as possible (minimum 60 degrees). See Bicycle Rail Crossings for additional guidance. Where it is infeasible to provide a separated bicycling facility (e.g. cycle track), bike routes should be provided on an immediately parallel street. Where bikes must cross rail tracks, provide a Two-Stage Queue Box (see NACTO’s Urban Bikeway Design Guide) to cross bikes at a preferred angle. 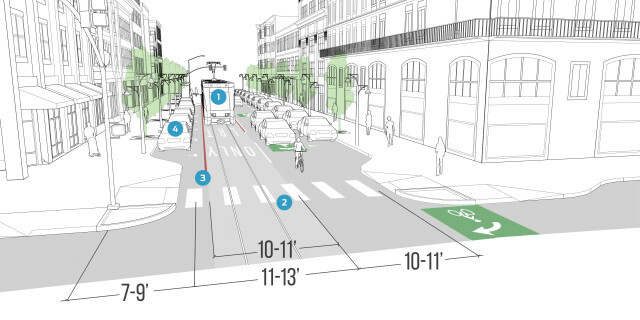 Bicycle Interactions and Streetcars: Lessons Learned and Recommendations. Alta Planning + Design (2008). The streetcar lane must remain free of obstructions. On both shared and dedicated lanes, parking and standing must be prohibited and strictly enforced, preferably with camera enforcement. In low-compliance areas, no-stopping tow-away zones must be implemented. Curbside streetcar lanes must be designated using LRT ONLY markings and appropriate signs including LRT Lane (MUTCD R15-4a), Right Turn Prohibition (R3-1), and No Standing (R7-4). Lanes should be 11 feet wide in most configurations, though they may be wider to accommodate the dynamic vehicle envelope at turns. Lanes may narrow to 9 feet at station platforms. Use appropriate paving material, such as concrete or large block pavers, to support rails and delineate the streetcar lane. The paved surface or markings should cover the swept path of streetcars (including mirrors), clearly indicating this clear zone to other drivers. Streetcar clear zones may be designated with a red stripe to reinforce visibility of the clear zone adjacent to parking, especially in narrow parking lanes where large vehicles may intrude into the streetcar zone. Ensure transitions between asphalt, curb ramps, and streetcar paving material do not create accessibility issues. Do not place concrete seams in bike paths, and ensure there are no lips between pedestrian path and streetcar pad. Parking lanes adjacent to a streetcar lane should be at least 8 feet wide, and 9–10 feet where truck loading must be accommodated. Any overhang into the streetcar path will interrupt service. On corridors with loading or commercial activities, manage freight loading zones to ensure streetcar lane remains clear. Use pricing and time limits to promote conditions in which one truck loading spot remains available within a short distance of each store. For curbside rail and on smaller streets, promote loading at low traffic volume periods, when a general traffic lane can be used for loading. Wherever possible, provide freight loading on the side of the street opposite a streetcar track, or around the corner. Implement transit signal priority techniques to reduce total travel time. Especially in destination areas where high walking activity results in long potential queue blockages, turns across the streetcar track should be managed or prohibited.